Potatoes and Cauliflower cooked spicly masala and herbs, is a very common North Indian dish. My mom use to make lots of varieties with Gobi and Aloo but not this combo. I didn’t know how aloo gobi taste like, till I had it in a restaurant in India. I loved it for the first time and it became one of my favorite dishes. 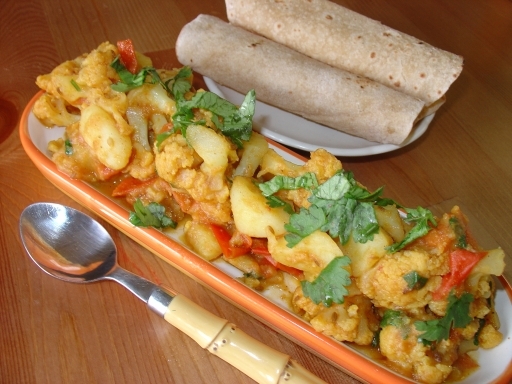 Aloo gobi is another classic dish from Punjabi cuisine, and is a “dry” Indian curry. Commonly used ingredients are spices (garam masala), garlic, ginger, coriander stalks, tomato, and cumin. A number of variations and similar dishes exist, but the name remains the same. One day I ordered Aloo Gobi and I ended up eating all alone, though my husband did not like it as it was bland and little dry for his taste. So I decided to prepare it at home with little variation. It’s been 6 yrs and I cook the same way and he loves it. I always make it less dry. 1 tbsp chopped coriander leaves to garnish. Bring 1 ½ cups of water to boil and add salt, cubed potatoes and cook till they are three-fourths done. Drain the water and keep the potato pieces aside. In the same pot add remaining water bring it to boil and cook cauliflower florets for 5 minutes. Drain and keep them aside. Heat oil in a deep sauté pan on medium heat and add cumin seeds, allow them to sputter. Add ginger garlic paste and sauté for couple of minutes, add potatoes turmeric powder and cook for 5-8 minutes covered, keep stirring occasionally. Add dry masala’s (coriander, garam masala and chilli powder) and sauté for couple more minutes. Add in chopped tomatoes, mix and put the lid back. Cook for another 5-8 minutes, add cauliflower florets mix and put the lid back. Cook for another 3-5 minutes. Add salt adjust the seasoning and cook for another 5-8 minutes or until the curry is done. Garnish with chopped coriander leaves and serve with your choice of meal. Do not put the lid back after adding salt. Cauliflower contains lots of moisture and after adding salt it tends to release the moisture. And also do not mix too many times after adding cauliflower, you will be breaking florets and the dish will turn mushy. You can even cook the whole dish (completely) in oven. Instead of parboiling veggies, mix all the spices and oil to the veggies and put in a oven safe dish, cover with foil and bake at 300/centigrade for 30-40 minutes. liked ur way of cooking it, home made garam masala makes such a difference. Aloo gobi looks mouthwatering and the platter looks so good.